"Troop Laden Duck on Invasion Road - So. 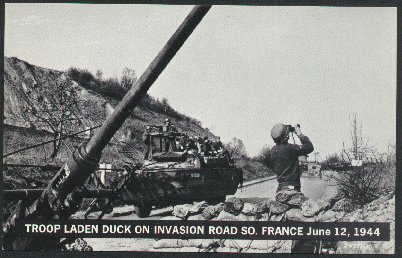 France - June 12, 1944"
(784) POSTCARD: Troop Laden Duck on Invasion Road - So. France - June 12, 1944-Condition: Very Good.- Black and White Photo, Courtesy US Army Photo and General Motors. Not Posted. Price: $4.00 + shipping.